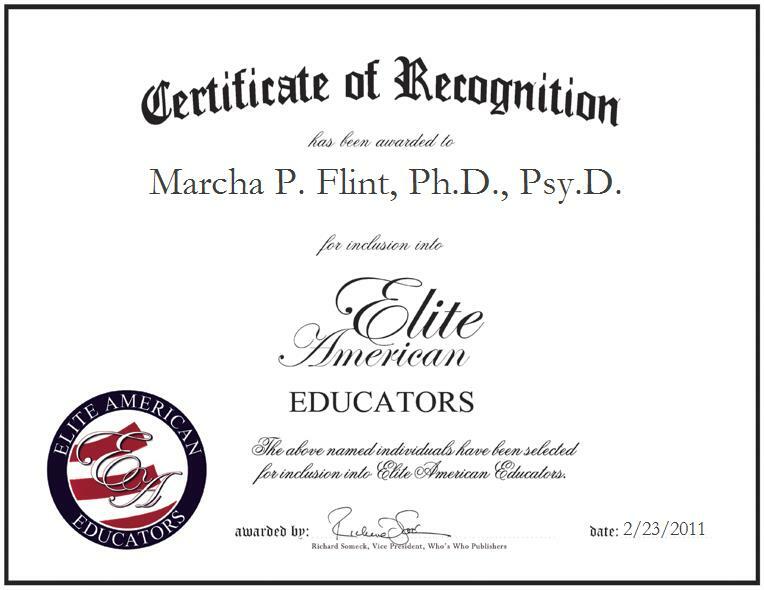 Montclair, NJ, February 23, 2011, Dr. Marcha Flint, Professor Emerita of Montclair State University, has been recognized by Elite American Educators for dedication, achievements and leadership in physical anthropology education. With 34 years of professional experience, Dr. Flint has enjoyed many accomplishments within academia. Attributing her success to her hard work and passion for teaching, she has held a matchless devotion to the development of the physical anthropology field of study. Utilizing her expertise in reproductive aging, Dr. Flint achieved great renown as the first physical anthropologist to study menopause in India within the rural populations of Rajasthan and Himachal Pradesh from 1969 to 1970. In addition, she trained four Master of Arts students from the University of Delhi, which resulted in the first cross-cultural analysis of menopause. This analysis of menopause symptomatologies compared the attitudes, beliefs and behaviors of Indian and American women. Following this research, Dr. Flint dedicated the rest of her career to this specialized study, and served as a mentor for other interested physical anthropologists. Dr. Flint became involved in her profession because she was inspired by her mentor at Hunter College to further her education and become a college professor. Her introduction to the world of university teaching began in 1964 at Hunter College in the department of anthropology. After four years, she attained an assistant professorship at Montclair State University, where she would advance to full professorship and remain until retirement. Following her receipt of a Master of Arts from New York University, Dr. Flint continued on to graduate from the City University of New York with a Ph.D. She also holds a Master of Psychology and a Doctor of Psychology in clinical psychology from Rutgers, The State University of New Jersey. With an impressive array of academic achievements, Dr. Flint has accumulated several awards, including multiple research awards from Montclair State University and a Fulbright grant. She is professionally affiliated with The New York Sciences Academy, the American Psychological Association, the American Association of Physical Anthropologists, the North American Menopause Society, and the International Menopause Society. Moving forward, Dr. Flint hopes to travel to Thailand, Vietnam and Cambodia on a Fulbright scholarship to continue her studies in cross-cultural anthropology. It is her belief that no matter where she does her field work, humans are the same everywhere because everyone has the similar emotional needs and feelings.